The marathon falls on a Saturday which made it perfect for a long weekend away. The start line merges the rather small 1500 odd marathon runners with the much more sizeable collection of half marathoners, so it feels pretty busy. 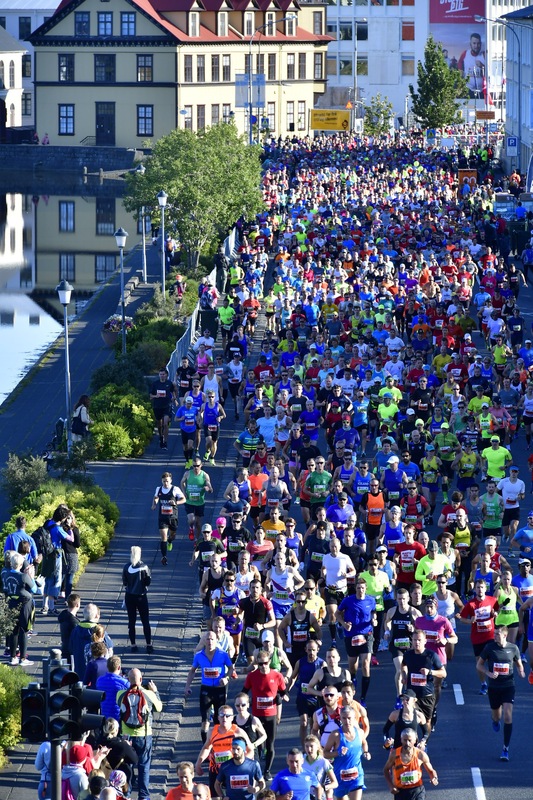 You get the vibe that you’re setting off in a big race even if it is quite a lot smaller than some of the big hitter city marathons. Music playing, a gun sounding, and you’re off. It was 8:40 in the morning when we started on the most gloriously sunny day. 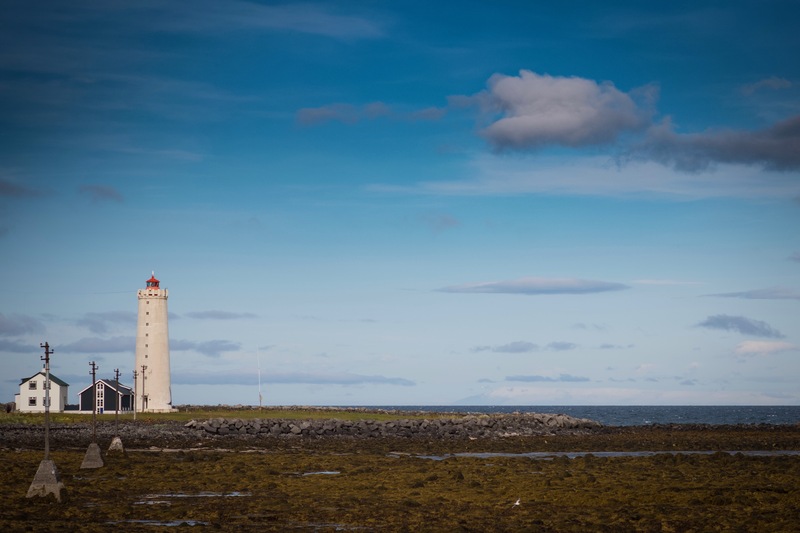 I had been concerned about the weather as it’d been cold and a lot windier the day before, but Iceland delivered the perfect conditions – a sunny light breeze and, if anything, it got a little too warm by the end. You wouldn’t have guessed the time by the support early on, as the Icelanders were out in force! Street parties, bands, cook outs, it was all going on and it was fricken electric. I had a list of sights we were due to run past in my head and I was head up, eyes wide open for the whole race as I just tried to take it all in. I honestly felt incredible. I’m not sure if it was the hype of the first half, the scenery, fresh air, or a cocktail of it all, but I felt pretty unstoppable. The route has a number of ‘pep stations’ which I just thought was the best name as, if I’m flagging at any social event, I’ll look to my sister and tell her ‘I need a pep up’. My sister – who is at all my races and is just the best cheerer – couldn’t make it to this one. Well these stations did her job really well, they were every few KMs and as checkpoints they made time fly by! The ‘pep stations’ were manned by volunteers, charities, radio stations, bands and they gave you such a boost. I kept having to consciously tell myself to slow down because I felt on fire. I told myself I’d settle for around 8:20 pace, as this didn’t feel ridiculous for me and seemed to be where that magical flow and my natural rhythm wanted to land me. The scenery everywhere is just heart eye emojis x 1000. 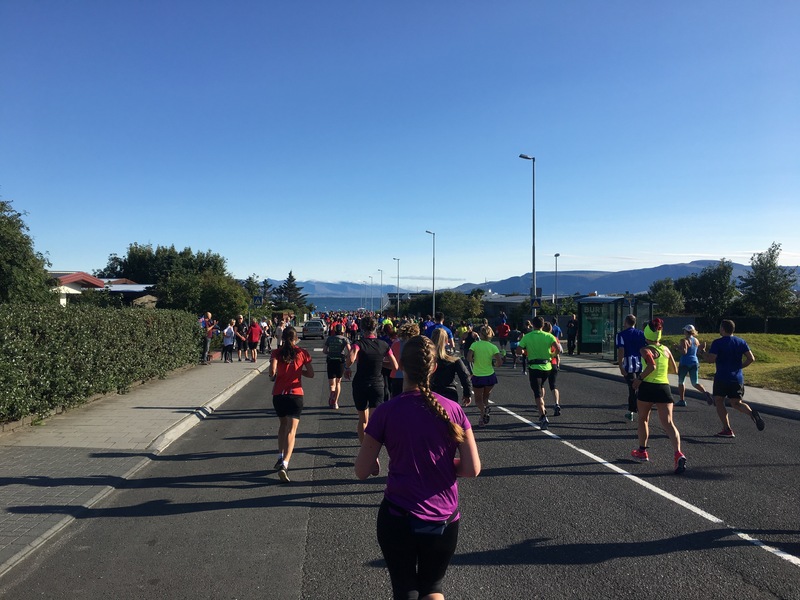 With this distraction and all that pep it felt by far the easiest marathon I’d run in terms of keeping my mind and body doing what it should be doing. There is seriously not a single picture of me from this whole event without a big stupid grin on my face, my cheeks actually hurt more than my legs at the end! At about 12 miles the half marathoners leave you to return to the city and the marathoners continue on. This part of the route got a little trickier, you go off in to more residential and commercial areas, and it’d be a while until I felt the same pep again. 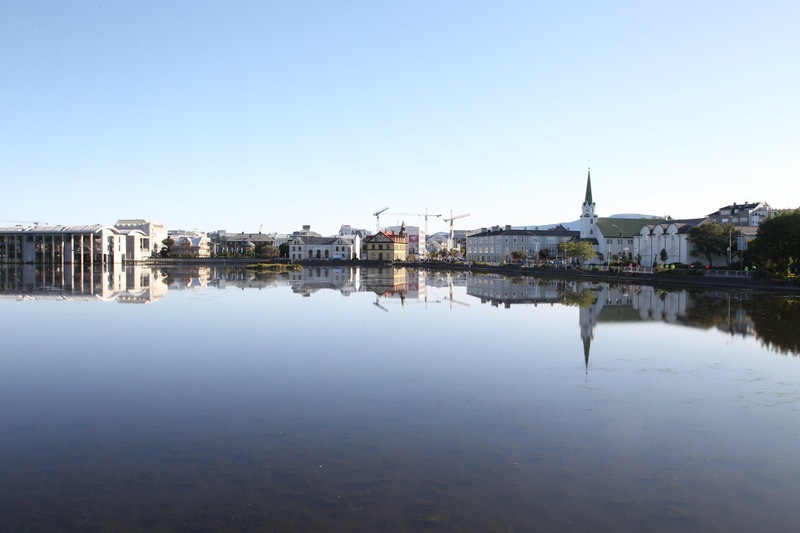 However Iceland is lucky that even when you’re running alongside a motorway or a sleepy residential side street, there is the back drop of mountains and oceans and cute little multicoloured houses, or oh yeah, a waterfall to distract you. At 18 miles I was still well under 8:45 pace and really felt unstoppable. You start to head out on a long stretch of coastal path and the headwind was picking up. Headwind – as we already know – is my nemesis, and this wasn’t even particularly strong, but it did start to feel a bit relentless with the path winding and seemingly never ending. I kept my head up, put on my emergency playlist and tried to concentrate on the views ahead. A blow up can happen for many reasons and for me I’m not all too sure what happened in mile 21-23, but my pace massively suffered. I think a little bit of under fueling was probably to blame and it’s a shame because if it hadn’t have been for those miles, I might have just done something pretty incredible. After this, I did what I could to steady my pace back to something respectable. I had this crazy idea that I wanted to finish faster than I had started, but I couldn’t quite manage it. 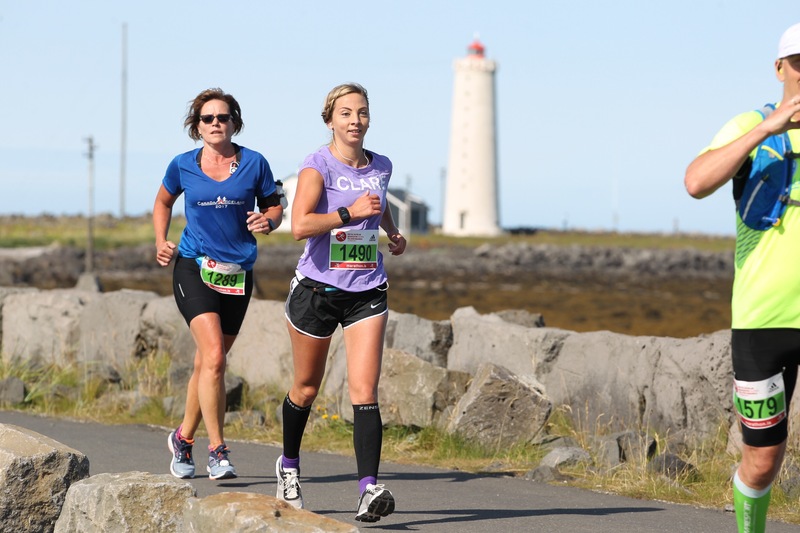 I did however bring the pace down nicely in those last 4 miles as I concentrated less on my running and more on ticking off the last of the marathon sights I had read about, the lighthouse. Coming in to the finish I knew I’d done something pretty special. 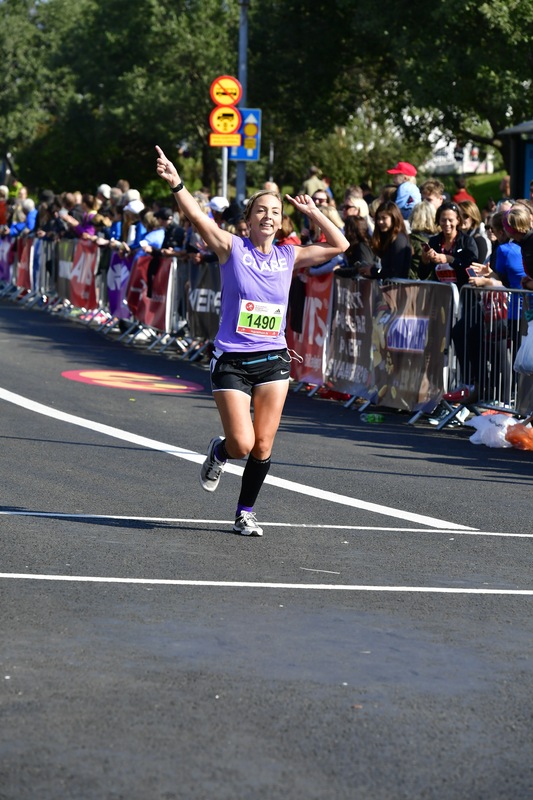 I’d run Sub4 again on a course that had its challenges and not only that, I’d managed a healthy PB; taking 6 minutes off! The time was great but more importantly for me I finally felt like I’d run a marathon the way it should be run. My new race tee has a slogan on it which translates to ‘run with your heart’ and in the most non cheesy way possible, that’s exactly what I did. There is not a single race photo of me without a smile on my face. That has so much to do with this amazing country and incredible race, but also with how much I’ve grown as a runner. I crossed the line not disappointed that I hadn’t pushed harder for that elusive GFA, but proud that I’d pushed exactly hard enough. My body was happy, my head was happy, and yep, heart pretty damn happy. I had proved once again that I had more in me, and thats something I plan to keep proving. 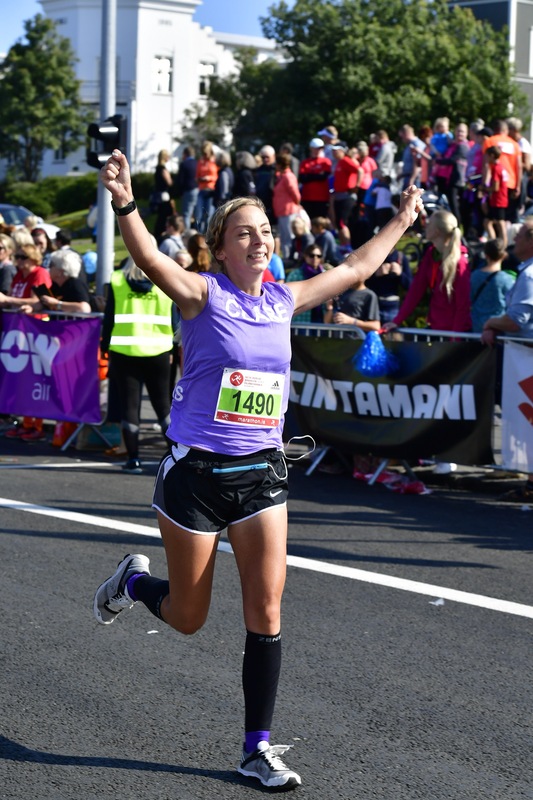 Life isn’t for settling it’s for living, and amidst a lot of personal turmoil, running once again taught me the life lesson I needed. 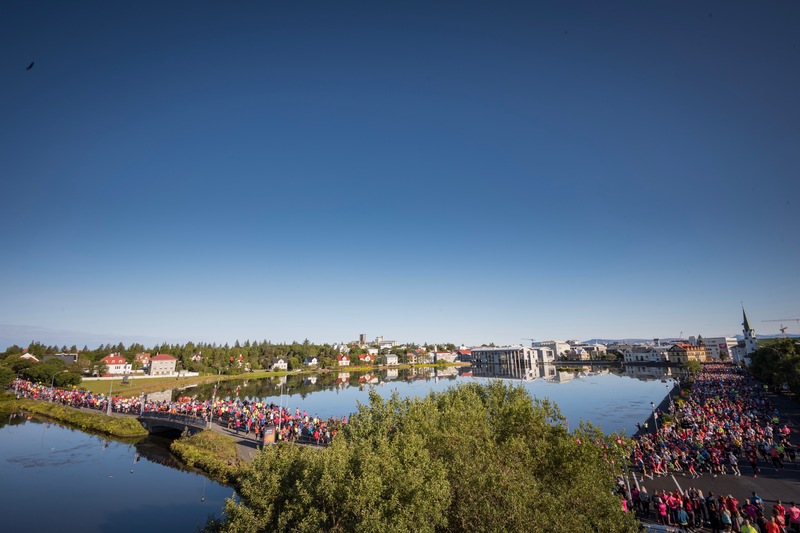 Add Reykjavik marathon to your list, you will not regret it. I’ve always said I’m not one for running races twice, I want to try new things and new places, but I would run that race tomorrow if you asked me too. It was truly everything an international city marathon should be; one big crazy beautiful adventure!